See scan - good condition. The badge has gone through some repairs back in time, but is a very good piece. 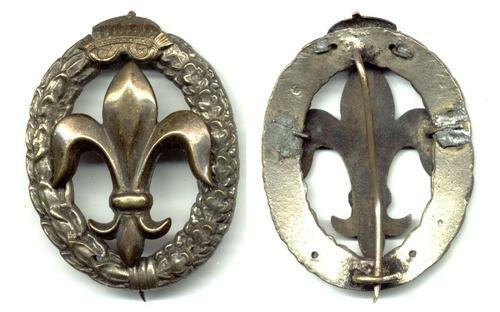 This is a nice and rare Bulgarian Royal WWII era boy scout organization leader badge with large fleur de lis in the middle of a heavy cast German type wreath. During WWII Bulgaria was a NAZI German war ally and the boy scouts organization was a paramilitary and most likely a pro fascist organization that was later banned by the communists. Scarce and very rare military / militaria collector piece and one of the rare Bulgarian badges.